JAJA Architects thinks that parking garages should offer more than just spaces to leave vehicles. The firm recently won a competition to design a massive parking garage in the new development area of Nordhavn in Copenhagen. 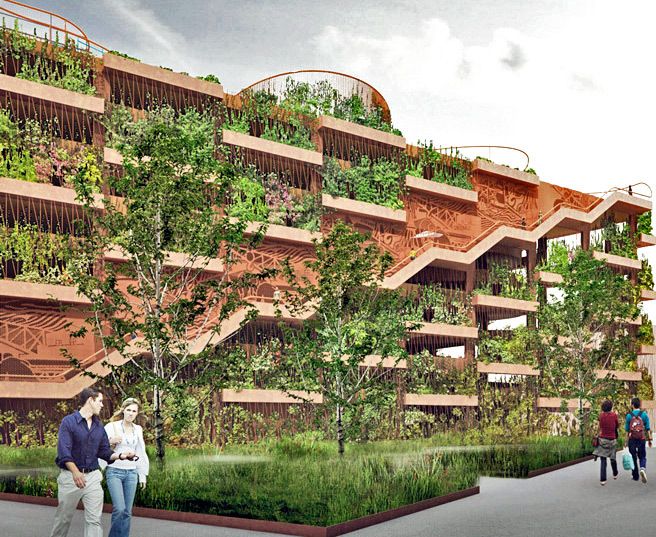 The garage will feature a green facade made up of planter "shelves", a green roof complete with a playground, two special staircases, and a railing that will allow pedestrians on the street level to easily navigate to the roof. The project is located in an area called the Red Neighborhood, named after its historic red brick harbor buildings. In a contextual nod, the concrete garage will be tinted red. Set in contrast to this red backdrop, the project’s green facade is its most noticeable feature. It is made up of a plant “shelving system” which interacts with the rhythm of the columns behind it. The planter boxes follow the structural grid of the parking garage with full height boxes placed in a staggered rhythm with every second column. The planters cover all four facades and provide coherence to the building. The roof and staircases up to it are other significant features of the project. The roof is made of an active landscape filled with resting spaces and play areas that include swings and climbing structures. 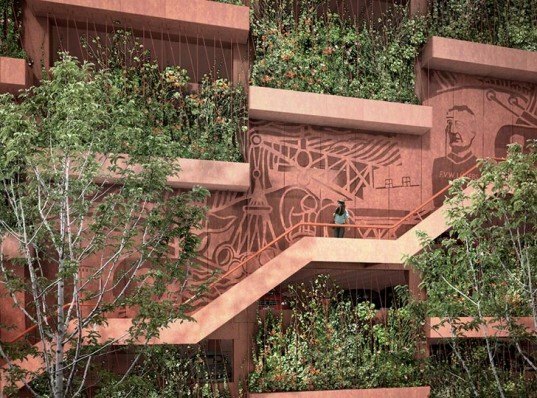 An elevated activity sculpture on the roof will be visible from the street, engaging the public visually from afar. The staircases are inspired by Centre Pompidou, where the vertical movement along the building facade is a special experience. Along the back wall of the staircases is a frieze based on the history of the area. The frieze will be visible from the street level and can be seen in more detail as visitors ascend the staircases. The railing of the staircase is called “the red thread” and is designed to be a physical guide that leads visitors from the street level to the roof. The project is located in an area called the Red Neighborhood, named after its historic red brick harbor buildings. In a contextual nod, the concrete garage will be tinted red. Set in contrast to this red backdrop, the project's green facade is its most noticeable feature. It is made up of a plant "shelving system" which interacts with the rhythm of the columns behind it. The planter boxes follow the structural grid of the parking garage with full height boxes placed in a staggered rhythm with every second column. The planters cover all four facades and provide coherence to the building. The roof and staircases up to it are other significant features of the project. The roof is made of an active landscape filled with resting spaces and play areas that include swings and climbing structures. An elevated activity sculpture on the roof will be visible from the street, engaging the public visually from afar. The staircases are inspired by Centre Pompidou, where the vertical movement along the building facade is a special experience. Along the back wall of the staircases is a frieze based on the history of the area. The frieze will be visible from the street level and can be seen in more detail as visitors ascend the staircases. The railing of the staircase is called "the red thread" and is designed to be a physical guide that leads visitors from the street level to the roof.